At Adco Office Furniture, we’re proud to offer quality office bookcases in Melbourne for storing books and folders safely out of the way. Whether you want a small bookcase with lockable cabinets or a large bookcase with adjustable shelves, we can provide a solution that’s tailored to your specific requirements. 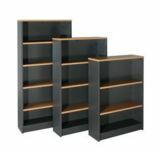 We guarantee our office bookcases will help you feel much more organised. Our bookcases in Melbourne are made to the highest standards of quality. You can rest assured that they’ll not only look great, but also come with shelves that support the weight of any items placed on them. Adco Office Furniture is your one-stop shop for office bookcases in Melbourne. For more information on our available products, call us on (03) 9808 4404 or fill out our online enquiry form.